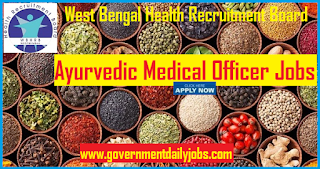 NOTIFICATION: West Bengal Health Recruitment Board (WBHRB), Kolkata under Government of West Bengal inviting online applications for filling up 98 vacant posts of Senior Ayurvedic Medical Officers in W.B. Ayurvedic Health Service in the Cadre of the West Bengal Ayurvedic Health Service (Basic Grade) under Health & Family Welfare Department, Government of West Bengal from eligible and interested willing candidates. It is latest & good information for unemployed personnel those who are looking for medical Jobs in Government sector & other organizations. Job seekers, who wish to apply for these vacancies regarding WBHRB Recruitment 2018, must have passed five years’ Degree in Ayurved with a required experience if asked. As per Govt. rules age relaxation is applicable to all reserved category candidates i.e.SC /ST/ OBC/ PWH/Ex Servicemen/Women candidates etc. NO OF POSTS: 98 vacant posts of Senior Ayurvedic Medical Officers in West Bengal Health Recruitment Board (WBHRB), Kolkata. 2. OBC Cat A: 10 posts. 3. OBC Cat B: 09 posts. EDUCATIONAL QUALIFICATION: A passed of a five years’ Degree in Ayurved from any University established by law or a statutory Board or Examining body of Indian Medicine or its equivalent as recognized under Indian Medicine Central Council Act 1970 and knowledge of Bengali – Spoken and Written is necessary. Desirable: Post Graduate qualification in Ayurveda from a recognized University. Applicants must have 06 months experience as House Staff as Ayurvedic Medical Officer in a recognized Ayurvedic Institution or Hospital OR 05 years’ experience as a Registered Ayurvedic Practitioner. Note: Candidate must be registered either in Part A of the State Registrar of Ayurvedic Medical Practitioner maintained by the Paschim Banga Ayurvedic Parishad or in Part I of the Central Registrar maintained by the Central Council of Indian Medicine. AGE LIMIT: Candidate’s required age should not exceed 40 years as on 01-01-2018 for Recruitment for WBHRB Sr Ayurvedic Medical Officer Recruitment 2018 for 98 Vacancy. HOW TO APPLY: For said posts (WBHRB Recruitment 2018 Apply Ayurvedic Medical Officer 98 Posts) eligible, willing and interested candidates may apply through online mode at official website up to last date. Applicants must retain a hard copy of online application for future reference. CONTACT ADDRESS: West Bengal Health Recruitment Board (WBHRB) under Government of West Bengal, BENFISH TOWER (1st & 2nd Floor), GN 31, Sector-V, Salt Lake, Kolkata – 700091/Tel/FAX No. 23570085 /Email - response@wbhrb.in. CONCLUSION: West Bengal Health Recruitment Board (WBHRB) Kolkata invites online application for the recruitment of 98 vacant posts of Senior Ayurvedic Medical Officers on regular basis from Indian residents who are eligible & interested; candidates can apply through online application. WBHRB Senior Ayurvedic Medical Officers Recruitment 2018: Job notification for 98 Senior Ayurvedic Medical Officers posts in West Bengal on temporary basis is out. Online Applications are invited by West Bengal Health Recruitment Board (WBHRB) up to 05 Nov 2018 (8 PM) for 98 vacancies. Candidates may visit www.governmentdailyjobs.com for all details. LAST DATE TO APPLY: 05-11-2018 for WBHRB Jobs 2018 for 98 Senior Ayurvedic Medical Officer Vacancy.